This is another piece I made at that embroidery class. 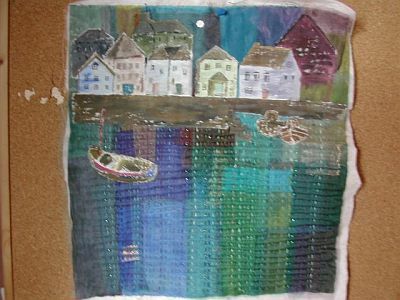 We painted calico with acrylic paints in large rectangles then layered it with voiles in different colours, then put on the houses and painted them and did the running stitches to make the waves. Haven’t finished this one either (surprise, surprise!). Must have a Finishing Month one day. That’s really lovely, I especially like the water. But hey, another half-eaten sandwich. I have just put all of mine into one drawer, but will I ever open it, that’s the question! ?